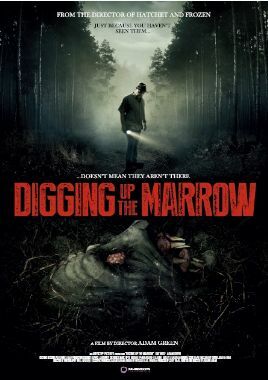 Built around Adam Green’s real-life production company, career, home life and filmmaking colleagues, DIGGING UP THE MARROW treads some similar ground to previous self-reflexive horror films like CAT IN THE BRAIN and WES CRAVEN’S NEW NIGHTMARE in which the directors portray a variation on their own persona on-screen in the context of a horror story about horror filmmaking. It opens in documentary style, with convention footage in which Tony Todd, Don Coscarelli, Lloyd Kaufman and, poignantly, the late Oderus Urungus discuss the enduring appeal of monsters. Subsequently, Green receives a journal from retired police detective Ray Wise, who claims to have uncovered a hitherto unknown world beneath the Earth’s surface that he names “The Marrow”, in which an apparently monstrous civilisation exists. Green and cinematographer Will Barrett document their meeting with Wise and stage all-night vigils in the woods, while mutual friend Kane Hodder shows up, dismissing the eventual “monster” footage they manage to capture before things get spookier. Green, a very likeable guy in real life, is a one-note presence here, portraying himself as a kind of pubescent Fox Mulder with a lifelong love of monsters and a geeky desperation to make the definitive “monster documentary”. He isn’t strong enough to carry a movie but Wise’s marvellous intensity and conviction as the possibly-deluded but fiercely intelligent monster-spotter saves the movie. Largely playing out as a self-indulgent, light satire of the over-saturated found-footage sub-genre, the flick does build steadily to a genuinely creepy conclusion and incorporates some neat ideas, though the jazzy muzak used for the “lighter” scenes will make you want to stab the next person you see in the face multiple times before turning the knife on yourself.